Caergwrle Castle was built by Dafydd ap Gruffudd on land granted to him by Edward I in return for his support during the First War of Welsh Independence. It was seized by the English followed Dafydd's rebellion in 1282 after which work started on upgrading it into a substantial fortification. A serious fire the following year saw the site abandoned and left to drift into ruin. 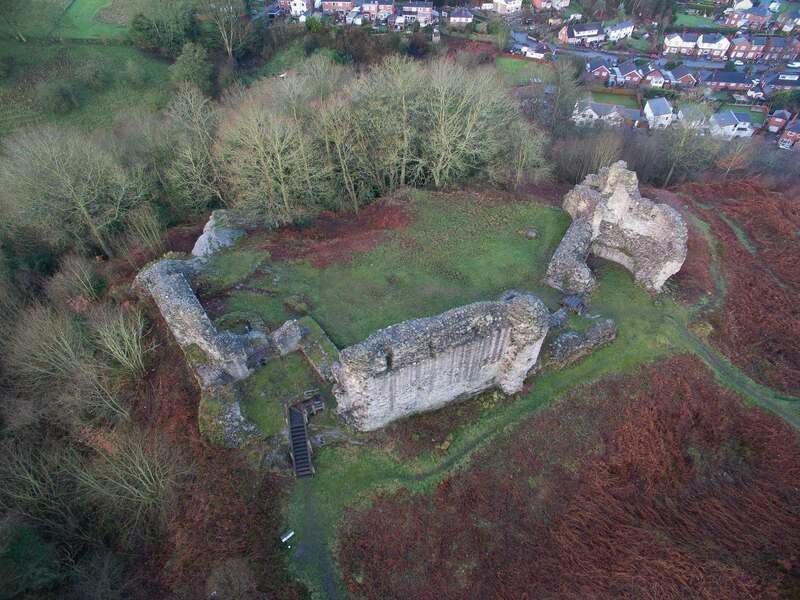 Occupying the site of an earlier Dark Age fortification, Caergwlre Castle was built circa-1278 by Dafydd ap Gruffudd. He was the brother of Llywelyn ap Gruffudd, Prince of Wales but had fought on the English side during the First War of Welsh Independence (1276-7) and was rewarded with extensive lands in Northern Wales as well as money to assist with raising the Caergwrle. 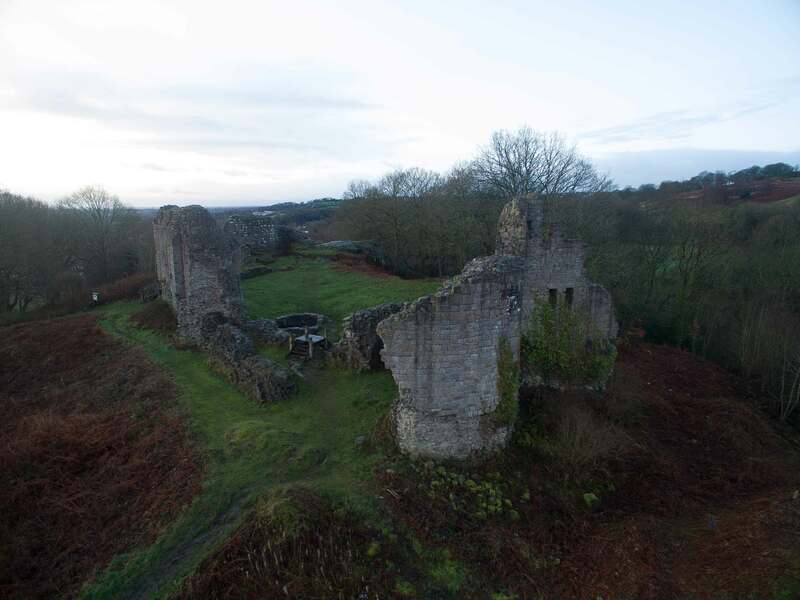 The castle was dominated by a large Round Keep whilst a curtain wall enclosed a modestly sized Inner Ward and connected at least two towers including a traditional Welsh 'D' shaped structure to the north. Despite his former support for the English regime, Dafydd rebelled against Edward I in 1282 starting the Second War of Welsh Independence (1282-3). Caergwrle Castle provided the base from which he marched to launch the initial attack on Hawarden Castle which started the war. Edward I launched a full scale conquest of Wales and Caergwrle Castle was captured on his behalf in June 1282 by Reginald de Grey. Dafydd's rebellion was defeated and he was captured then executed at Shrewsbury earning the dubious honour of being the first individual to be hung, drawn and quartered. Caergwrle Castle was taken into Royal ownership and major repairs were undertaken. Nearly 1,000 men were employed on the improvements which were, at least partly, overseen by Master James of St George - the King's chief engineer. Work was still on-going in February 1283 when Edward I gave the castle to Queen Eleanor. A town was laid out adjacent to the castle which, on 25 June 1283, was granted the right to hold a weekly market. However on 27 August 1283 a fire gutted the castle and work came to a halt. Although the structure passed into the hands of Edward, Prince of Wales no further repairs were made. In 1308 the castle was granted to John of Cromwell on the proviso he restored it. What work, if any, he did is uncertain but by 1335 the castle was reported as ruinous. It was never rebuilt and later stone was robbed to support other building projects whilst the structure itself was also undermined by quarrying in the immediate vicinity. Today only a portion of the original castle survives. Avent, R (1983). Castles of the Princes of Gwynedd. Cardiff. Harston, C.L (2000). Caergwrle: an enigmatic castle. Ceiriog Press, Wrexham. Mansley, J (1990). Excavations at Caergwrle Castle. Archaeology Data Service. Timbs, J and Gunn, A (1872). Abbeys, Castles and Ancient Halls of England and Wales. London. Caergwrle Castle sits on top of a hill overlooking the town of the same name. Much of the structure has been lost to quarrying including the bulk of the South Tower (Keep) and the western curtain wall. 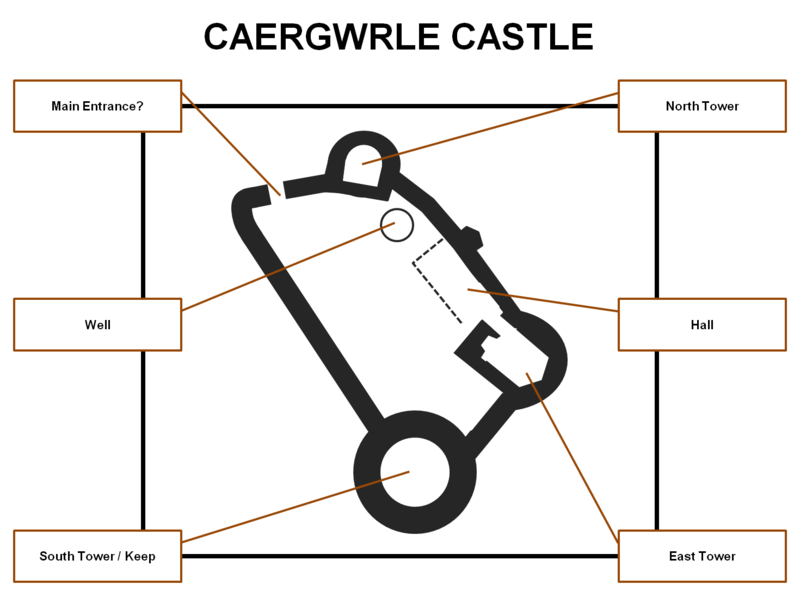 Caergwrle Castle Layout. The castle was dominated by the Keep. There may have been additional towers on the west side but evidence has been lost due to quarrying. Caergwyle Castle. View from the north. Caergwrle Castle is accessed from a footpath that starts next to the war memorial on Wrexham Road. Visitors are recommended to use the central car park detailed below.